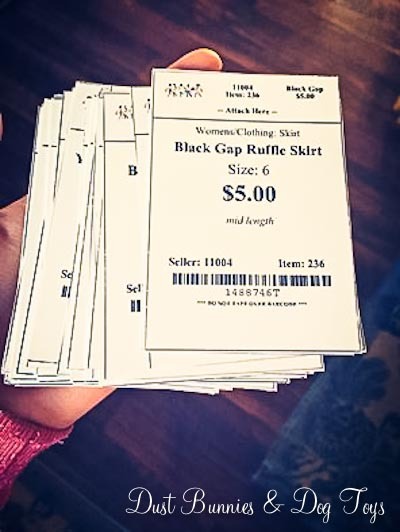 I’m not one for hosting yard sales – especially since we live in the boonies and no one would find it – and dealing with people on the buy/sell pages can be quite a headache, so when heard about an upcoming consignment sale for women’s and girls’ clothing I figured it was worth a try. I’d recently purged my closet and still had a stack of stuff left from the previous purge so I certainly had plenty to offer. In total I ended up with 115 items! I registered as a consigner, paid the $10 consignment fee and started entering my items into the online system. Making sure I had the correct size and category for each item was a bit tedious, but it helped when I printed the tags generated by the system and started tagging items since I had several that were similar. I rented a tagging gun from the sale’s organizers so I could attach all those tags with the plastic barbs just like the department stores. Although it’s a fairly simple tool I couldn’t quite figure out how to load the barbs. Luckily, a quick online search pulled up a YouTube video that got me rolling. After a few attempts I felt comfortable with the gun and things went pretty quickly. 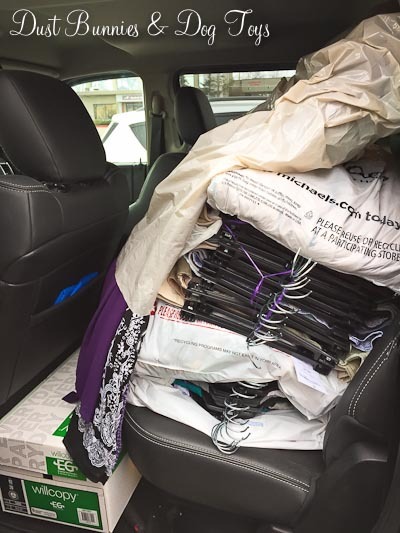 This sale required consigners to provide their own hangers. I certainly wasn’t giving up my nice felt hangers and didn’t want to buy plastic hangers to use, so I was glad to hear other consigners suggest asking local retailers for their extra hangers. I stopped by the Sears where I meet my carpool to see if they could spare some. 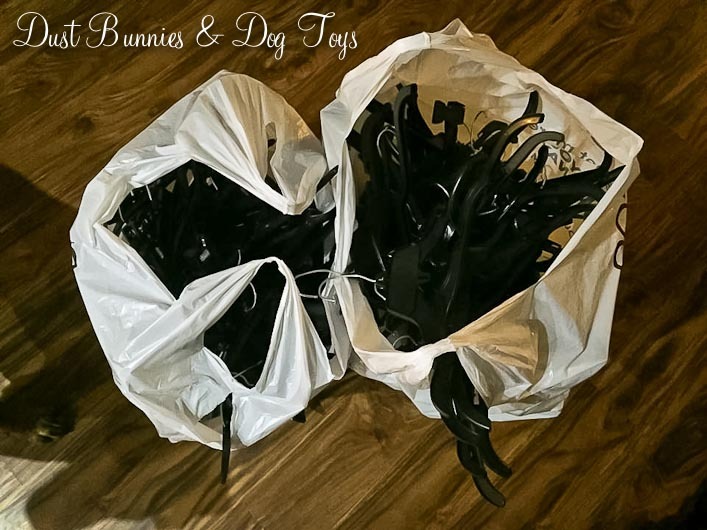 Apparently they – and many other retailers – just throw hangers away so the cashier was happy to help me load up two large bags from the bins under her register! Now that I had everything on hangers and tagged I organized everything by category in the guest closet (which was completed just in time!) and bagged batches of items so they would be easier to transport to the sale. I can’t take credit for this awesome idea, it was another suggestion from the sale’s organizers. But it sure worked well! I opted to work a few shifts at the sale so instead of the standard 65%, I got to keep 80% of my sales total. Since the sale was located 45 minutes from my house I decided to work shifts when I already planned to be there such as organizing and putting out items when I dropped off my items, a shift just prior to the half-off presale and a third sorting the left over items when I came to pick up my own items. And because I was out on the floor for all of these shifts I also got to see what was available and set aside a few items I wanted to try. Make a list of items you’re looking to add to your wardrobe so you can keep an eye out for them, but don’t limit yourself to just that (unless you’re shopping on a budget) because you might find a great deal on something you didn’t even consider. Try on everything before buying. Because this is a consignment sale there are no returns if you change your mind once you get home. Be open to altering something you try on to make it just right, but be realistic about the options each piece will provide so you don’t end up with something you won’t use. Don’t try to sell items that are obviously out of style, unless your sale is right before Halloween or a community event like 80’s prom! Consider the season of the sale when selecting items. Sweaters don’t sell as well at spring sales and shorts aren’t very popular in the fall. Double check all of your items to make sure there is no damage that might keep it from selling. And if you find something either mend it or remove it from your sales list. Price your items fairly. Here’s a handy chart to help and a few more tips on increasing your sales. Go for it! If you’re going to go through the process of registering, prepping and tagging you might as well offer as many items as possible and increase your chances of earning more. I hope these tips help you find consignment success, either as a shopper or a seller! If you have additional tips, please share them with a comment below.